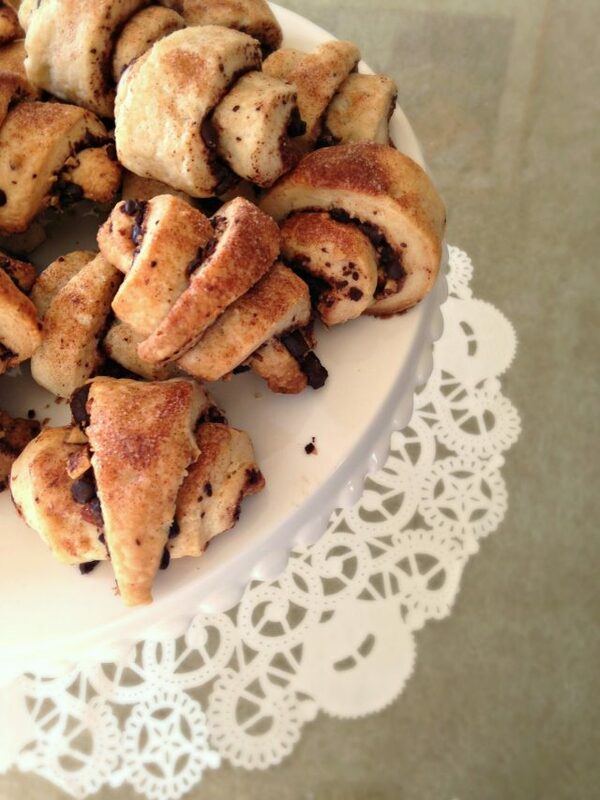 Nevertheless, I still enjoy rugelach when the little cookies make their occasional appearance at holiday parties. 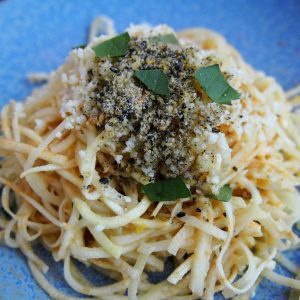 I just never really thought to try making them myself until I came across a recipe on Annie’s blog. 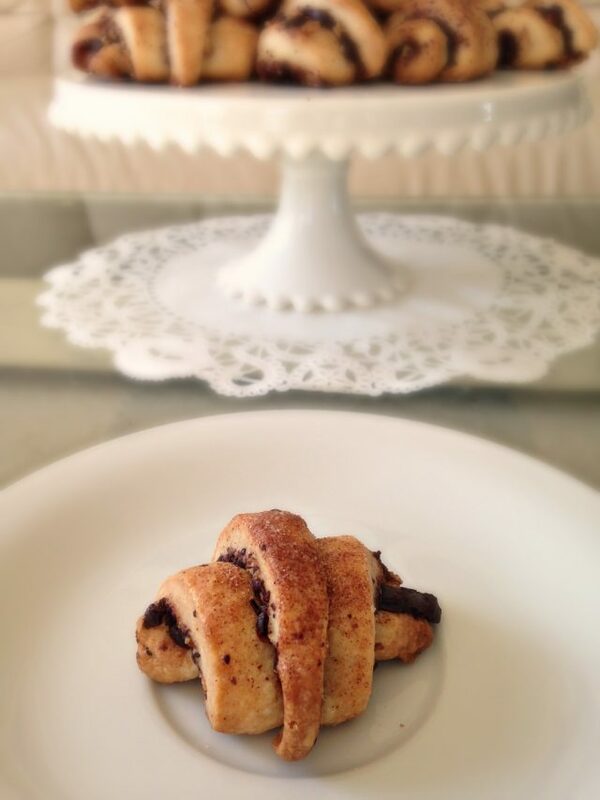 The filling in rugelach (especially the Costco version) is typically very sweet, but with my changes, much less so. I used 72% dark chocolate and salted roasted almonds because that’s what I had, and it complemented the tender cream cheese dough perfectly. Even my mom, who usually denounces carbs and sweets in the name of health (yeah, right…) couldn’t resist these. I severely underestimated the time it would take to finely chop almonds and chocolate by hand, but when all the prep work was done, slicing the triangles and rolling them up into little crescent shapes was actually a lot of fun. It would probably be more fun if I had a pizza cutter, but I don’t (or at least I couldn’t find it) so I had to make do with a sharp knife. The shape and texture of these cookies once baked is so unique and aesthetically pleasing, and the flavors are very adaptable. As soon as I figure out a more efficient way to chop chocolate, these cookies are going to the top of the giftable baked goods list! Blend the cream cheese, softened butter, and confectioner’s sugar in a large bowl. Add the extracts, mixing until combined. Then add in the flour and mix until a dough forms. You may want to use your hands to help knead the dough into a soft ball. Wrap the ball of dough with plastic wrap and refrigerate until firm, at least 2 hours. When you are ready to make the cookies, preheat the oven to 350˚ F. Line baking sheets with silicone baking mats or parchment paper. Cut the dough ball in half and transfer one half to a lightly floured work surface, returning the other half to the fridge while you work. Use a rolling pin to roll the dough out into a thin circle about 12-13 inches in diameter. Use a pastry cutter, pizza cutter, or sharp knife to slice the dough in half and in half again and again until you have 16 equal triangles. Lightly brush the dough with heavy cream and then sprinkle half of the chopped chocolate and half of the chopped almonds on top. Working with one triangle at a time, roll up each piece of dough into a log, starting from the wide edge of each triangle so that the tip of the triangle ends up on the outside of the log. Place the shaped cookies on the prepared baking sheets, seam side down. Repeat this process with the remaining disc of dough and the remaining fillings. Once all the cookies are assembled and on the baking sheets, lightly brush the cookies with a bit of heavy cream. Combine the sugar and cinnamon in a small bowl and whisk together to blend. Sprinkle the cinnamon-sugar mixture lightly over the cookies. Bake until golden, about 24-28 minutes. Let cool on the baking sheets for a few minutes, then transfer to a wire rack and let cool completely. You can add whatever you want for filling – just don’t overfill especially with jam or preserves because the log will be messy. People often use various fruit preserves, nuts, dried fruits, and cinnamon/sugar.